Weda of today is specialised in underwater cleaning solutions with automatic and semi-automatic robots. The cleaners are developed in cooperation with our end users in the pool industry, water and sewage industry and general industry worldwide. The cleaners are built around the more than 50 years’ experience within Weda of pumps for underwater usage. Weda is a privately owned Swedish Corporation with its manufacturing facility in Sweden and world wide sales through a network of subsidiaries and distributors. The Public Pool Sector – Cleaners designed for all types and shapes of commercial pools, aqua parks etc. The cleaners designed for ultimate cleaning performance and reliability with the highest level of automation. The Industry Sector – Cleaners designed for all types of application within the industrial sector. From reactor tanks in nuclear power stations to large outdoor reservoirs for irrigation, cooling tower tanks, fountains, zoos, glass works etc. Weda aims to offer the customers the best solutions based on cost, efficiency, reliability and environmental aspects for whatever the cleaning project may be. 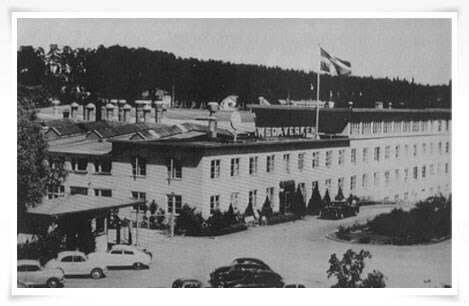 Aluminiumfoundry started by Mr. W. Dan Bergman in Södertälje, Sweden. Production of household items. The company has grown into an aluminum and magnesium foundry. 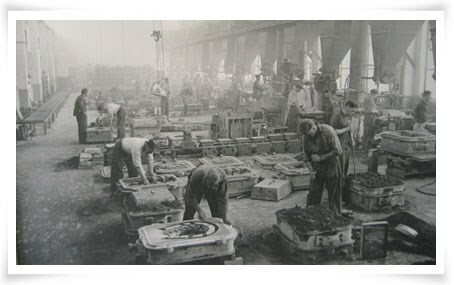 Production of military goods and parts for airplanes. Major customer – Bofors AB. WEDA, acquired by Bofors AB three years earlier, now has a Swedish pump manufacturer as customer - Flygt. Flygt starts it’s own foundry. Weda introduces it’s own brand of submersible pumps - the Weda pump. WEDA employs 700 people making WEDA the biggest employer in Södertälje. The company introduces it’s first swimming pool cleaner – a pump with a brush and rod attached to it. Weda introduces it’s first automatic pool cleaner – the B600. Introduction of the B400 series of automatic pool cleaners. Weda is asked to help the Stockholm water company develop a machine for cleaning sedimentation basins. Development of the SD System sludge collector begins. WEDA Poolcleaner ISO 9001 certified. The first installation of six Weda SD System sludge collector systems at the Lovö water works in Stockholm, Sweden. The VR-600 for on-line cleaning of water reservoirs is introduced. Weda is acquired by the Eletta group. Trials start with the YT-800 machine for cleaning slow sand filters. Again, the target is to avoid emptying the basins. The B680 automatic pool cleaner is introduced featuring a new filter system and an ergonomic handle which makes handling of the robot much easier. Weda becomes sole supplier of cleaners at the Olympic Game in Athens. Several Weda VR-600´s are delivered to Service Provider around the world. SD installations are made on several markets. Weda becomes a privately owned corporation. First orders from Veolia, Vodokanal and other major water companies around the world. New installations are continuously made in various industrial basins. A special cleaner is developed in cooperation with Westinghouse Service for cleaning in nuclear power stations. The product portfolio from Weda now offers solutions for sediment removal in basically all types of tanks and reservoirs. Lack of water around the world, increased demands on water producers and industries, along with improved public awareness of the importance of clean water has assisted in the continued growth of Weda products. Weda has today a worldwide reputation of being the company to turn to for water reservoir maintenance.